Google is suffering from a one-two punch in China, as Chinese news agency Xinhua teamed up with the country's largest telecom carrier, China Mobile, on Thursday to create a new search and international media company, according to an Associated Press report. The move by the Xinhau-China Mobile team couldn't come at a better time (for them), given Google's neutered search capabilities in that country. 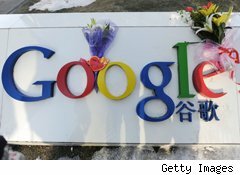 Google (GOOG), which had been fighting with the Chinese government over its desire to censor Google searches, reluctantly reached a comprise with the Chinese government in July that sets up a landing page for folks going to Google.cn. Once users get to that page and click anywhere on the site, they're redirected to Google's uncensored Hong Kong site. As a result of this awkward arrangement, Google's competitors have been kicking it while it's down. Baidu, (BIDU) for example, posted a 6-point gain in its market share to 70% in the quarter ending June 30, according to the AP report. Meanwhile, Google's market share declined by a similar spread to 24.2% in that period. Sensing weakness in the Internet search giant, other companies that previously had no skin in the game are now jumping into search. Earlier this week, Chinese e-commerce company Alibaba Group (ALBCF) moved closer to becoming a search player. According to an IDGreport, Alibaba is acquiring a 16% stake in search engine Sogou, a unit of online portal Sohu.com. And, of course, there is the Xinhua-China Mobile effort. Xinhua signed an agreement with China Mobile that lays out the parameters of the new venture, which the companies describe as hitting a "substantive operation" stage, according to the AP report. The companies, however, didn't shed any light as to whether the arrangement is centered on Internet search or mobile search. Google holds a 12.3% slice of the Chinese mobile search market, while Baidu retains a 34.3% piece and Easou.com 16.9%, according to the report.